FAT DIRECT SHOT is the latest fat burner and pre-workout 2 in 1. 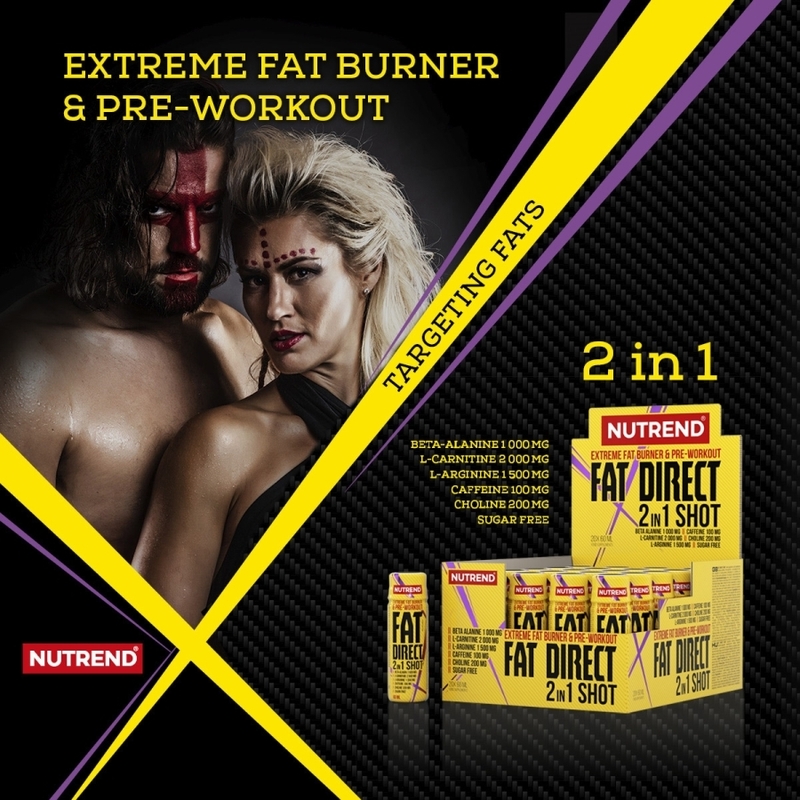 We introduce a unique connection between efficient substances for weight loss and physical exercise support. This helper in the diet regimen or hard workouts provides stimulation of the organism, lowers tiredness and supports fat metabolism effectiveness. 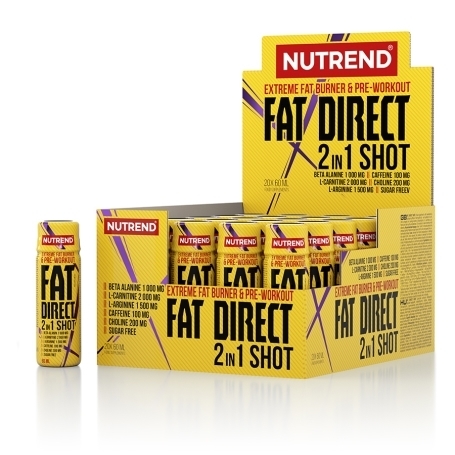 FAT DIRECT SHOT is sugar-free. Amongst the efficient substances, we can find favorite amino acids such as L-Carnitine, L-Arginine, Beta-alanine, and choline. Energetic metabolism is supported by vitamins B2, B3, B5, B6 and biotin. Recommended dosage: drink 1 shot 15 minutes before the physical activity. Maximum daily dose is 60 ml. Do not exceed the recommended dosage. Warning: Food supplement, with sweeteners. Contains caffeine (100 mg/60 ml) – not suitable for children, pregnant or nursing women. 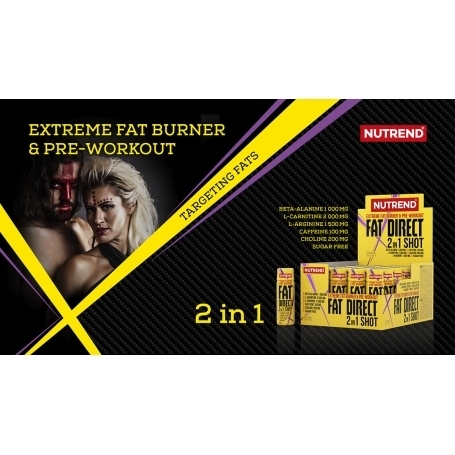 Combination of L-carnitine, caffeine and other active substances. The product is also enriched with vitamins. Does not replace varied diet. Keep out of reach of children. Store in a dry place at a temperature that does not exceed 25 °C and away from direct sunlight. Do not freeze. The producer is not liable for any damage caused by improper use or storage. For date of production and best before date see the top of the bottle. Ingredients: water, L-carnitine, L-arginine, beta-alanine, acidity regulators malic acid and citric acid, glucuronolactone, aromatic emulsion (flavouring, colouring agents E 150d, E 104 – may adversely affect the activity and attention in children), choline chloride, caffeine, preservatives potassium sorbate and sodium benzoate, sweeteners acesulfame K and steviol-glycosides, nicotinamide, riboflavin 5´-phosphate sodium, sweetener sucralose, calcium D-pantothenate, pyridoxine hydrochloride, sweetener neohesperidin DC, D-biotin.